Every three months, my workplace’s network domain will prompt to change our password. And this tri-monthly exercise would affect all the other intranet sites and systems, namely Subversion (SVN). Now, this is not a major problem because the organisation uses single sign-on via LDAP or Active Directory i.e. you can access the other intanet sites or systems with the same User ID and password. 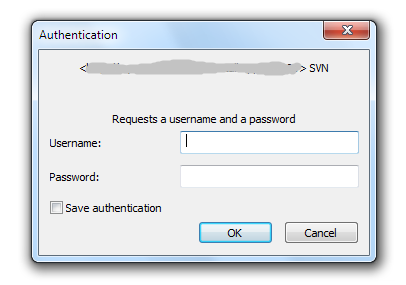 But recently, I noticed SVN doesn’t remember me, even when I clicked on the “Save authentication” check box at the TortoiseSVN‘s authentication window. As I later found out, this is no fault of TortoiseSVN, although I am using an older version of it – TortoiseSVN 1.6.16, Build 21511 - 64 Bit , 2011/06/01 19:00:35. This is because saving my authentication credentials via IntelliJ IDEA doesn’t work too. Frustrated, I searched the interwebs and found the same question asked in Stack Overflow. There are several possible solutions that might worked, but I only tried one, which is the one below. Depending on the version of Windows you are using, this folder might reside in %APPDATA%\Subversion\auth if you are using Windows XP; or %APPDATA%\Roaming\Subversion\auth for Windows 7 and later. Using Windows Explorer, go to the subversion folder, click on the auth folder and hit the DEL button. If you are using the CMD prompt, just use the command rmdir /S /Q %APPDATA%\Subversion\auth or rmdir /S /Q %APPDATA%\Roaming\Subversion\auth, depending on your Windows version. This is ad-hoc solution. I have also tried this other answer and hope it works without removing the Subversion\auth folder.